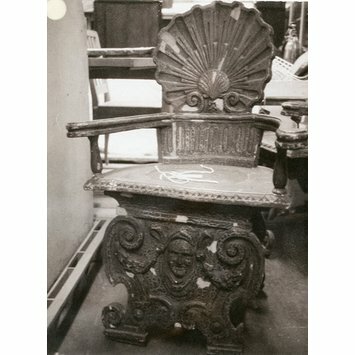 Armchair of carved oak and beech. The arms, balusters and front slat are of beech and the seat and back are of oak. The back is in the form of a scallop shell. It has flat scroll-shaped arms of the 'caquetoire' type supported on turned baluster rests. Below arm level, the back is of rectangular fluted form. The seat is semi-circular, with a circular depression in the centre. There are two solid cartouche-shaped supports. The one at the front is carved with a mask, festoons and scrolls. It is connected to a similarly shaped plain board at the back by a turned stretcher. Two chairs, W.44-1984 and W.44a-1984 given by Mrs BJ Mornement, a cousin of Sir Leigh Ashton, who inherited them from him on his death in 1983. Two of a set of five purchased at auction at Christies in 1953 by Sir Ashton (the then Director), Ralph Edwards (the then Keeper of Furniture) and the museum (W.9-1953). The other two were in 1955 aquired by the Birmingham Museum and Art Gallery and were displayed in nthe entrance hall at Aston Hall. Similar chairs at Holland House were said to have been designed by Francis Clein (1582-1658), a painter and designer who also worked at Ham House and the Mortlake Tapestry Factory. Clien was closely associated with Inigo Jones. 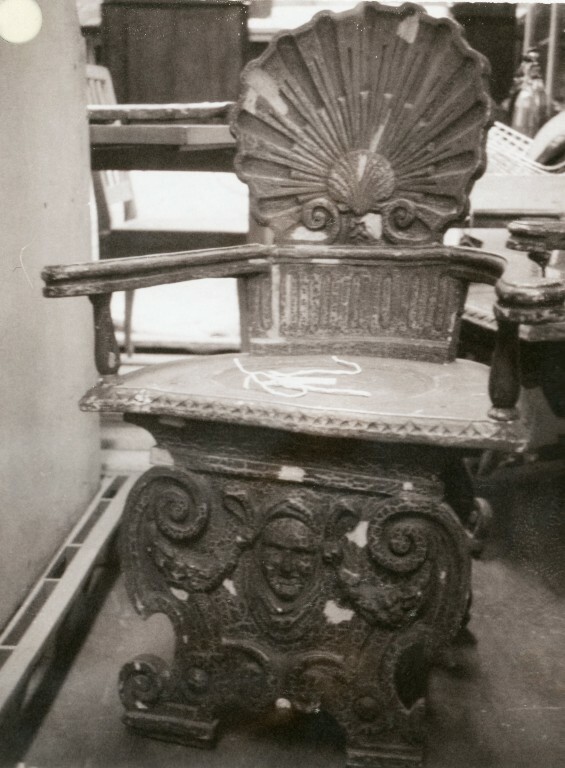 Hall chair, one of a pair.